As cliché as it might sound, foundation is the foundation of any makeup look. If you’re going for a natural aesthetic, then you need to find the right foundation that gives a fresh, light face while still providing full coverage. If you want a more dramatic look, then the foundation of choice will be slightly more saturated because you’ll most likely be contouring and so the foundation will provide a strong base for the other makeup layers. I don’t claim to be a makeup artist, but I do pay very close attention when I’m in the makeup chair and I ask a ton of questions. I get a lot of personalized info and have learned a lot. I guess it’s kind of become more than a hobby for me… I really do love makeup – I love playing with all the different products and figuring out which ones work best for my skin and which colours match best for my tone. The more I practice, the easier it has become to identify what works and what doesn’t. So, I’ve put together a list of my top 5 favourite foundations, all of which have been makeup-artist tested and approved! The Dior Star Fluid Foundation is what I use when I want that photo finish – it’s infused with silica beads so that when the light hits, your skin looks neutral rather than shiny. Incidentally, it brightens the skin, which sounds like a contradiction, but it’s true and it works! There’s an instant glow when you apply the Star Fluid Foundation, but it has a built-in “light-trap” as Dior puts it. You all know I have a serious thing for Guerlain. After Maxime Poulin did my makeup and gave me a full one-hour tutorial on how to play with colours and find the perfect products to match my skin, I have been addicted to certain Guerlain products. One such product is the L’essentiel Natural Glow Foundation 16-hour Wear. It has such a comfortable texture and provides a great buildable coverage so I can layer my bronzer and blush on top and know that the foundation will enhance the colour rather than absorb it. It also gives off a slight glow, which I love! 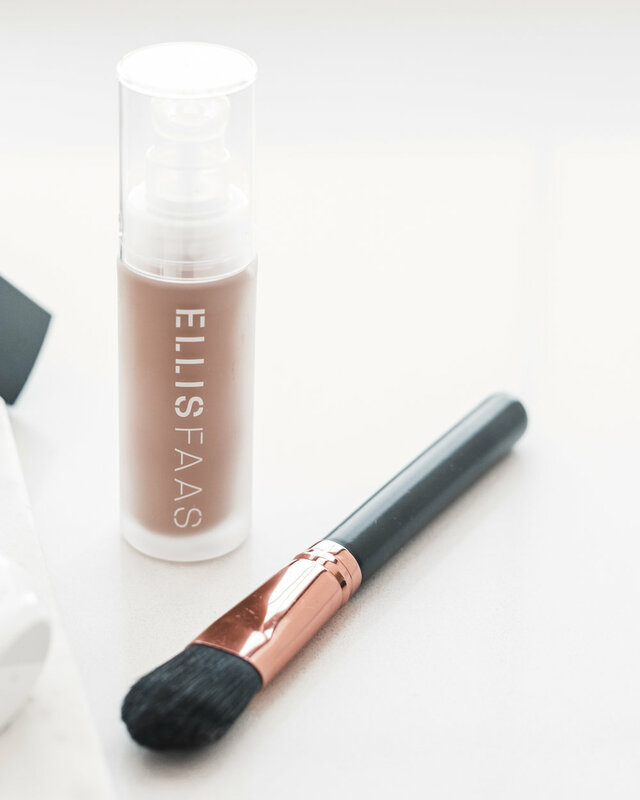 The Ellis Faas Skin Veil Foundation is so well named. It acts as a veil on your skin – meaning, it blends into your skin to neutralize any red spots or dark/uneven tones, but it also glides on so thinly that it gives off this porcelain feel. The Skin Veil Foundation also has moisturizing contents to nourish and protect the skin, which I love because that eliminates one step in the makeup process. Whenever I apply foundation, I use my fingers for a natural-looking coverage. I’ve been known to use a brush, but I prefer my fingers… it’s something about the skin absorbing the product better. Light Wonder by Charlotte Tilbury is a fan-favourite. She hit the ground running with influencers becoming obsessed with her brand. And, I’m no exception. I love all Charlotte Tilbury products, especially the Light Wonder Foundation. It’s got youth-boosting elements in the sense that your skin will look flawless with this lightweight, wrinkle-covering, pore minimizing foundation. It’s got SPF 15, which makes this the foundation that I find myself grabbing when I’m packing for a vacation. Sometimes I use the Light Wonder to cover spots on my body, it’s that sheer and light. Ok, so the name is a mouthful, but the foundation is fantastic! The YSL Fusion Ink Cushion Foundation is a shin-free, buildable, all-day wear foundation. I love that this product is in a compact rather than a liquid. It allows me to practice my many foundation-applying techniques (lol!) – but seriously, I use this YSL foundation more as a touch-up product, although it can be used as a full-coverage foundation. Like the others, the Cushion (I shortened the name!) gives a radiant and smooth complexion. There are a ton more foundations I’ve tried and loved, but I would say that if I had to break it down to the 5 important categories (travel, touch up, full-coverage, natural look, and brightening effects) then these 5 hit all the essentials. It’s important to know your skin tone when you purchase the right foundation – it makes all the difference in looking natural and flawless versus caked on. Try to find the exact match or one tone (slightly) darker. I also always look for foundations that have built-in moisturizers, because you know that means the foundation is lightweight and will glide on smoothly.